…an astringent produced from the leaves and bark of the North American Witch Hazel shrub (Hamamelis virginiana), which grows naturally from Nova Scotia west to Ontario, Canada and south to Florida, and Texas in the United States. This plant was widely used for medicinal purposes by American Indians. The witch hazel extract was obtained by steaming the twigs of the shrub. The essential oil of witch hazel is not sold separately as a consumer product. The plant does not produce enough essential oil to make production viable, however, there are various distillates of witch hazel (called hydrosols or hydrolats) that are gentler than the "drug store" witch hazel and contain alcohol. Witch hazel is mainly used externally on sores, bruises, and swelling. The main constituents of the extract include tannin, gallic acid, catechins, proanthocyanins, flavonoids (kaempferol, quercetin), essential oil (carvacrol, eugenol, hexenol), choline, saponins, and bitters. Distilled witch hazel sold in drug stores and pharmacies typically contains no tannin." Most drug stores and online pharmacies carry witch hazel in one form or another. My favorite is the handy Witch Stick. But when you get your hands on the mightily useful little medicinal marvel, what can you do with it? Here's a rundown. It's very useful, so put it on the top of your next shopping list. If your baby's rash isn't healing quick enough, apply witch hazel solution (Dickinson's is good) with a cotton ball and you should see immediate improvement to your baby's bottom. Not only does witch hazel tighten skin, it's also a good anti-itch remedy. By combining witch hazel with aloe, glycerine or petroleum jelly and rub it on external hemorrhoids, you will reduce itching significantly and dry up most bleeding. Mix together 1 tablespoon honey, 40 drops lavender essential oil, 15 drops lemon essential oil, 15 drops bergamot essential oil, 5 drops peppermint essential oil, 1 teaspoon carrot seed oil and 1/2 cup aloe vera gel. Once completely mixed, and 1/2 cup distilled witch hazel and mix again. Pour mixture into spray bottle and use on affected areas (avoiding eyes). A more potent and less unsightly way to treat the chicken pox than traditional calamine lotion. Been in a fight recently? Well, maybe not. But if you bang your leg or arm and are left with a nasty bruise, a thrice-daily dab of witch hazel can help speed up the healing time of the bruise. Healing damaged skin is one of witch hazel's specialties. But as sunburn is also a type of skin inflammation, witch hazel is ideal for treating this too (despite swelling not being obvious). Treating sunburn with witch hazel will lessen healing time and prevent the infamous skin peeling and flaking. By applying witch hazel immediately after showering, you are locking in the moisture that has just soaked into your skin. Many chemists and pharmacists refer to witch hazel as nature's answer to Neosporin. Applying a dab of it will cleanse the cut, protects against infection, and encourage quicker healing of minor skin breaks. With its anti-itch and anti-inflammatory properties, witch hazel is ideal for treating bug bites. Just dab a little on the affected area. NOT by squirting witch hazel in them, but by soaking a clean rag in witch hazel and cold water and placing the cold compress over your closed eyes. After 10 minutes, your eyes should be refreshed, and any redness should be gone. If you've been doing a lot of crying, this can get you back to normal quickly. Measure the vodka into a 4 oz (100 ml) glass bottle with a spray attachment. Shake vigorously to dissolve the essential oils. Label the bottle and the deodorant is now ready to use. Before you use the deodorant each time, give the bottle a good shake to ensure the essential oils are fully dispersed. As with many herbal remedies, certain people, like women who are pregnant or breast feeding, should talk to their physician before using witch hazel. When using witch hazel, let your doctor know if you experience leg swelling, breathing problems, chest tightness or pain, hives, new rashes or irritations, nausea, upset stomach, vomiting or constipation. Most people who use witch hazel will not experience these adverse side effects, but some will, so notify a health official if any problems are noticed. I am glad I ran by this site I didn't know that witch hazel was so useful. I love it when people use homeopathic remedies on pets and themselves. Pharmaceuticals aren't always the way to go and can be more hurtful in the long run with side affects and what not esp.. with pets and not knowing for sure what is wrong plus they grew up in the wild and we always have to do right by them. I will def. try this with my babies ear infections. For myself too with this heat and my face getting all icky with my makeup, lol. Is there a way for me to get some of these recipes...like the tea? Plan and simple deodorant: Half fill a bottle with Witch Hazel, add baking soda until the bottle is 3/4 full shake and you're done. As a dog deodorant put straight witch hazel in a spray bottle and spritz your dog. The dog smell is gone! Witch hazel will also get rid of acne cysts. Especially if they are painful and infected. drench a cotton ball in witch hazel, place it over the cyst and secure it with a band or two just before u go to bed for the night. Remove it in the morning and u will notice a slight decrease in the size of the cyst. With my expierience, I would need to do this 3 nights in a row. Each morning finding the cyst being smaller and much less painful. But dont push on the cyst and dont think u will need to put any pressure on it at all, u dont. Just let the cotton ball sit there and sleep however ur comfortable. Pushing on the cyst will only make it more painful and can cause it to rupture. when comments are made about tea, it is not drinking tea, but a liquid that is to be applied for external use. i don't think you should drink witch hazel. it is only for external use. Nova Scotia is an EASTern province; not west of Ontario. Yes, that's what he said. Notice it says it grows FROM Nova Scotia WEST TO Ontario. If it is growing westward, that obviously means it is in the east. I use Tucks pads, it's for hemroids , but works wonders on face and chest ! Whenever I scraped my knee or whatever (which was quite often, I was always climbing trees/fences but I am also notoriously clumsy) My mom had a bottle of Witch Hazel capsules in the house and anytime I was bleeding, she's pull apart the two pieces of capsule and sprinkle the contents onto my wound- instant scab. One really important use for Witch Hazel is for postpartum vaginal healing. It was given to me as a foam that was to be applied to the stitched up area. It was like instant relief. I now use the Dickinson brand as a daily wash as I learned it helps tighten, improve yeast infections, and so on. And a giant bottle is about five bucks. Love this thing. Haemhorrids remain the most painful thing I've ever experienced. For years I just led in bed feeling extremely low and in complete agony whilst I had them. It really killed my spirits and took me a long time to get back to my bubbly self. For people who think I'm exaggerating, you've obviously not experienced bad ones. This stuff on a cotton bud on them is an absolute life saver. I still hate it of course when I get them, but this stuff makes them far more tolerable. Thank you god for creating the person who created withhazel mixed with tea tree oil! I have heard a few dermatologists recommend witch hazel for zits but I am reluctant to try anything besides Citrus Clear because it has been the only products that control my oily skin and acne. It dries it out and prevents it from becoming be a horrible, noticeable, angry, red, zit that everyone stares at in business meetings. I wash with Citrus Clear at night and in the morning - and i Use their Control Moisturizer - I can't find it in the stores anymore so thankfully amazon sells it. I'm going to start using Witch Hazel for my acne. And as a toner. I hope it works! I have had rosacea for about 15 years, of course getting gradually worse. Imagine the worst sunburn all over your face, that never goes away. Seriously felt like I was running a fever constantly. Dermatologist tried pills, cremes, etc, no help. I tried pretty much everything in the natural care aisles at several coops and health food stores. Stumbled across witch hazel, and it calmed my skin down A LOT. I use Dickensons for preference and follow up with a light moisturizer. My rosacea is the flushing type, with very little rosacea acne (follows my hormone cycles and results in max 5 pimples per episode = I am EXTREMELY lucky). This does not prevent my acne episodes, but it calms them down quickly. It calms the redness down, and minimizes my pores a lot. It dries up the acne and keeps it from recurring. It is not a cure all for my rosacea, but helps a lot! Did not know it worked on swollen ankles and good for aftershave, so looking forward to giving those a try next!! I just came across this sight. I love reading all the uses for witch hazel. I have been using on my face for adult acne. It works! Will start using for more things. Thanks for all the info. has anyone used it for gums disease appaently for dogs you can. but what about people? Found your recipe on Pinterest. But there is no Witch Hazel in the ingredients list. As written ; 1 Tbsp honey, 40 drops Lavender EO, 15 drops Lemon EO, 15 drops Bergamot EO, 5 drops Peppermint EO, 1 tsp carrot seed oil, 1/2 C Aloe Vera gel. Looks like a great recipe to treat several conditions. How much Witch Hazel do I add to this. Thanks. for mothers that are over weight do to child birth... i applied on a daily bases after a shower, shrinks stretch marks and helps tighten the hanging belly, arms, thighs, buttocks, breast, and private areas. Will help to shrink inches on you waist and legs. 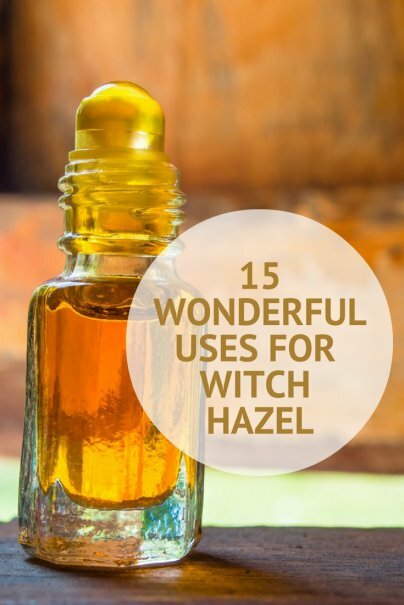 i have used witch hazel on many things for over a series of months and have found many things other them what is stated above that it is great for. I now realize there may be no fountain of youth...but i believe this plant is the "Tree of Youth". My new name for this extrodinary tree is "The Garden of Eden"...cause when i think of this plant, it automatically makes me think of Adam and Eve and the Lord above. Cheesy i know, but thats is what comes to mind. Until next time...thank you for letting me post..
My dad has hemorrhoids and my mom takes baby wipes (Huggies), she cuts them into little squares (about 2in by 2in) and puts witch hazel on them. I put a pad on my acne and let it sit for a couple minutes. It helps reduce the swelling, the redness and it brings it to a white head. and the headache would stop. I am 74 now and keep it on hand still. I'm gonna give this a go but first I would like to know if witch hazel can be used on dogs for itching scratching and biting at themselves. My dog which wrights about 12-15 pounds and is a mix of chiwahwah and minnpinn bites, scratches, and itching due to a flea now and then or it might be and allergy. Not sure. Please let me know if it's safe to use on him. And will it deter fleas. I've gone thru half of a 16 oz bottle and nothing has changed in the appearance of my skin. I have had an bag under my left eye since this past summer and it hasn't done a thing. Nothing is getting rid of it, that I've tried anyways. I use witch hazel to make my hair curl a little after I wash it and it has air-dried a bit. It makes a more finished look without all of the chemicals and junk in other hair care products. hi, I have a red swollen nose, rash also on belly and back. Will witch hazel help? I have terrible spider veins on my legs and are extremely conscious of them. Does which hazel work in ridding or reducing them?